Sports fans are prone to wild exaggeration. It only takes the emergence of a fresh-faced 19-year-old with the ability to kick a ball accurately over 30 yards for millions of otherwise sane people to declare a new deity. The Superbowl may be one of the world’s leading sporting events, but it is the Hyperbole that unites most sports fans. Possibly the wildest exaggeration since Joe Lapira was heralded as the new John Aldridge. Even taking this into account, a new sculpture in Shannon Airport is quite something. 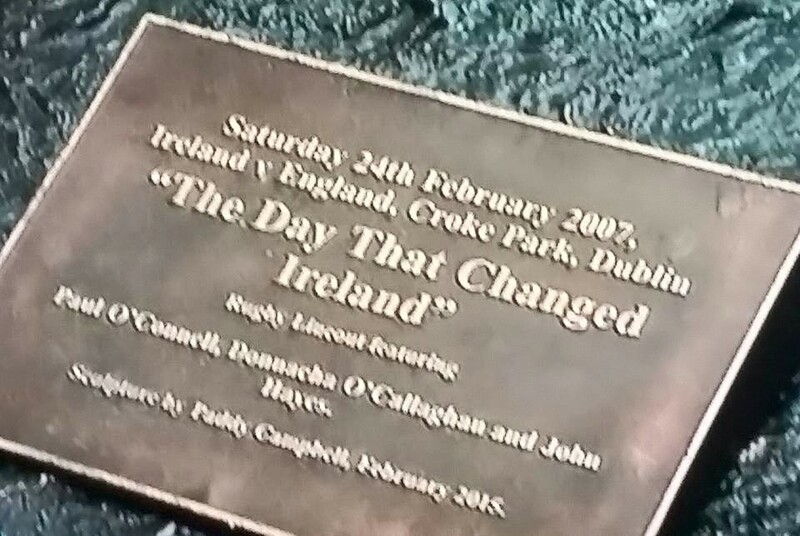 Commemorating a rugby game between Ireland and England, the plaque which accompanies the 20-foot statue proclaims the event to have been “the day that changed Ireland”. 2/ The game in question did transcend sport to some degree, in the sense that the last group of Englishmen to enter the Croke Park pitch had been carrying guns and had shot dead 14 people. Who knew that these rugby players were reaching into the sky to pluck out a better Ireland? There is no doubt that the statue which accompanies the plaque is a very fine work of art. Lots of people will like it, although some may wonder why it is located 230 kilometres from where the game in question actually took place. 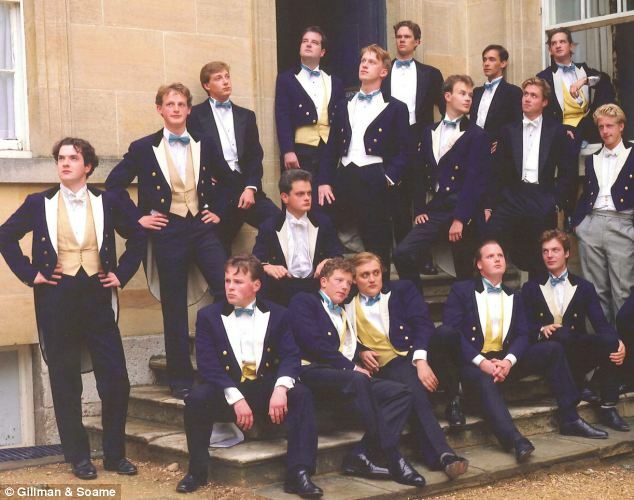 However, the claim that this game of rugby could change the outlook, culture and destiny of an entire nation is about as fanciful as backing Cristiano Ronaldo to become Secretary General of the United Nations. Sport can bring communities together and change attitudes but it is extremely rare for any singular sporting event be itself to change anything other than the destination of a trophy. South Africa’s rugby World Cup win in 1995 is regarded as a significant moment of nation-building in the post-apartheid era as black and white united to cheer a team that had once been closely associated with the racist state. But can we really liken Ireland in 2007 to South Africa in 1995? By the time that game was played, the agreement that ended the Northern Ireland Troubles was almost 10 years old, and it is safe to say that rugby was not exactly emblematic of either side in that conflict. Not only is it ludicrous to suggest that the Irish nation could be changed forever on the basis of a rugby game, it is also mildly offensive to suggest that we in some way needed ‘changing’. What was wrong with us when we woke up on that February morning in 2007 that urgently required the intervention of Paul O’Connell? Was Ireland really so awful that it required Girvan Dempsey selflessly throwing himself into the mud beyond the English try line to save us? Upon the final whistle the entire Irish nation transformed into better people. Those of us who did not watch the game in question (let us not forget that despite a national narrative drunk on exaggeration, the majority of people in Ireland have at best a passing interest in the sport) were unaware of this ‘Stars in their Eyes’ moment when the nation woke up as bigoted savages and returned to bed as urbane sophisticates. 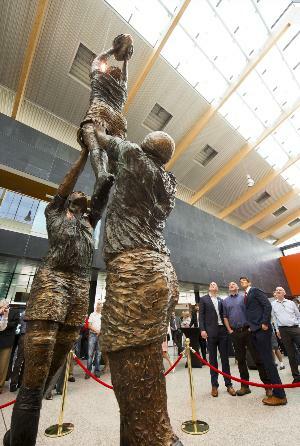 The new statue was broadly welcomed as a fitting tribute by a media that have bought into Irish rugby with the same enthusiasm as they once embraced holiday homes in Bulgaria. Commenting on the statue, the Irish Examiner referred to the rugby game as “one of the great Irish moments of the new millennium”, a damning indictment of the absolute omni-shambles that has been 21st century Ireland. The one positive of this ridiculously over-stated plaque in Shannon Airport is that it brought back happy memories of an episode I was involved in relating to Ireland’s most famously ridiculously plaque. The plaque commemorating Fr. Pat Noise on Dublin’s O’Connell Street. My Watergate. 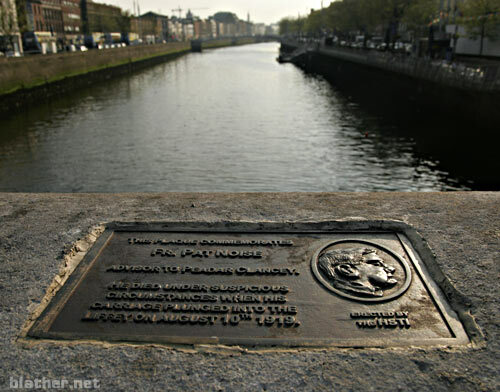 Way back in 2006 Ireland was so drunk on money that nobody noticed the appearance of a plaque on O’Connell Bridge commemorating the death of a “Fr. Pat Noise”, a man who, according to the bronze tribute, “died under suspicious circumstances when his carriage plunged into the Liffey on August 10th 1919”. A phone call to Dublin City Council confirmed that they had no record of this plaque having ever been sanctioned. Several phone calls to historians confirmed that nobody had ever heard of Fr. Pat Noise. I wrote the story of The Sunday Tribune and soon it went viral, as we would have called it had we known what that word meant at the time. All the other newspapers followed-up on the story of this mysterious plaque and Dave Fanning even introduced me onto his radio show as “eagle-eyed journalist”. After an initial bout of head-scratching and vague promises to remove Fr. Pat Noise’s plaque, the City Council announced that it would remove the plaque, which seemed a fairly logical thing to do to a fraudulent piece of guerrilla art. This sparked a negative reaction from members of the public who began leaving flowers at the site along with messages of love and support for the fictitious priest. In fact, Fr. Pat Noise and his tragic drowning became such a much-loved part of Dublin folklore that Councillors later voted to over-rule a Council decision to remove the plaque. In terms of journalistic legacy, uncovering the mystery of the plaque on O’Connell Bridge was no Watergate but the story of Fr. Pat Noise still brings a smile to many faces who pass it each day and has even made it into guide books of the city. You could say that it was a story that changed Ireland. But that would just be ridiculous.